What? LeeRoy in Danger? Absolutely!! So LeeRoy asked me to update his friends. He’s been overly concerned these days about challengers to his territory. Apparently this group of about 5 Coyotes (pronounced Ky-OH-tees) have been showing up in our second field at between 9-10PM every night for the past week or so. They look lean, mean, and hungry. One comes out into the garden baiting LeeRoy. The pack’s glowing eyes can be seen in the opening from our first into our second field when we shine our car’s headlights there. SO . . . 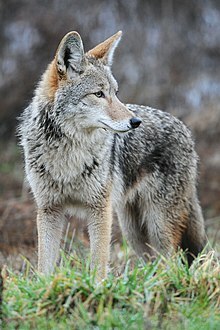 The alpha coyote comes into LeeRoy’s garden (Remember: LeeRoy the Garden Dog). He immediately gets LeeRoys attention. LeeRoy starts barking like crazy. LeeRoy’s bark is scary too–really low and loud! The coyote turns to run so that LeeRoy will run after him to the second field–where the pack stands ready to attack him. BUT . . . They don’t know LeeRoy. They underestimate his cowardice. He is extremely afraid of other dogs (yes, even girl dogs) so he won’t give chase, he simply moves away from the garden closer to the house. Barking over his shoulder. The closer he moves to the house, the more he barks (as though he’s really tough). The lead coyote is baffled, but keeps trying to bait LeeRoy by running at him and then turning with his tail between his legs when LeeRoy barks at him. Last night, Cheryl–who lives with us–tells me that her headlights are on the pack. So I grab my gun (pellet) and take a shot at the gang. The noise of the gun going off (I was surprised how loud the pellet gun sounded. I think a .22 would have been quieter.) scares LeeRoy. So LeeRoy runs away from me right toward where the gang is laying in ambush. We all start calling, and whistling for LeeRoy to come back. I hide the gun behind my back. Cheryl goes down, grabs his bowl and starts clanging it with a spoon as she shovels food into it and hollers for LeeRoy. Luke–who also lives with us–calls for LeeRoy too. LeeRoy stops just short of where they’re hiding and heads back a little and sits to see what all the noise is about at his food bowl. Every once in awhile glancing over his shoulder at the opening in the field. Meanwhile, the coyotes are pacing back and forth and the alpha coyote heads out of the garden, back toward where his gang is hiding. They’re frightened by all our shouting for LeeRoy. So we realized . . . we can’t get LeeRoy into the house. We can’t shoot at the coyotes or chase them with my machete or LeeRoy will think we’re after him. But that gang won’t give up. They’ll be back again tonight. This is where you (or someone you know)come(s) in. If you have a solution, please comment here. If you know someone who has a solution, why not help LeeRoy by sending this post to them so they can respond to us? Thanks. QUESTION: What do you think we should do to help/protect LeeRoy from this evil, hungry looking bunch? I’m opened, though I can’t speak for LeeRoy. You need to get him in the house – he is in danger and he can’t make it on his own. He trusts you and you don’t want the changed. I know he already has issues but lure him in. A couple of gangs asked me to join them. I’m pretty good with a bowstaff.